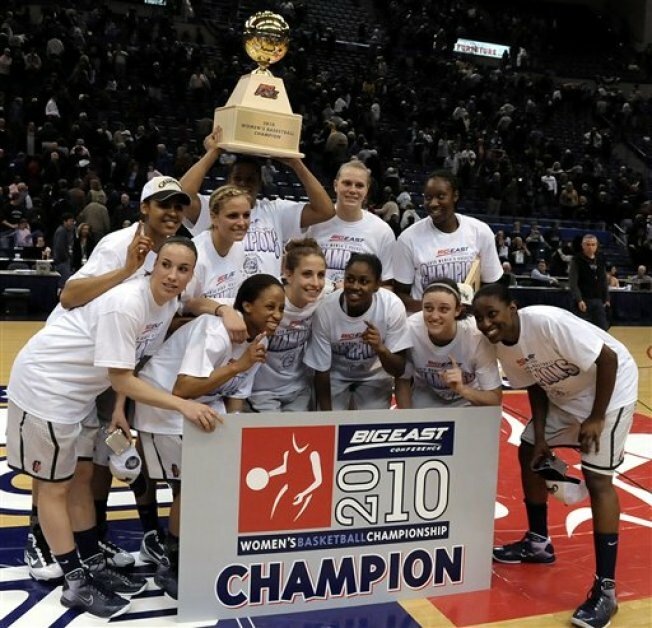 A night after winning their 71st game in a row, the UConn women took on West Virginia in the Big East Championship game. The women wasted no time and extended their streak to 72 consecutive wins. They pounced on the Mountaineers from the tip-off, and won the game with a final score of 60-32. Kalana Greene lead the game 15 points and 12 rebounds for the Huskies, earning herself outstanding player honors for the Women’s Big East Tournament. Liz Repella led the Mountaineers with 10 points and a rebound. The Huskies were up 27-10 with a little under seven minutes left in the first half, but the Mountaineers mounted a 18-6 run that spanned the rest of the first half and five minutes into the second half, bringing the score to 33-38. But then the Huskies took over, scoring 27 of the last 29, and putting away the game. West Virginia scored only once during the final ten minutes of play. The UConn women have won five out of the last six Big East titles, and 16 Big East titles in school history. They will enter the NCAA tournament unbeaten for the fifth time in school history, and are a sure-fire number one seed going into the tournament. The women are also six wins shy of playing two whole seasons of undefeated basketball. Their next game will be either March 20 or March 21 in the NCAA Tournament.